Newman Russell Marshman was born on 19 December, 1846, in Manhattan, New York. He was the son of an English-born real estate agent, Benjamin Marshman (born 1810), who moved to America in 1830s, and his Pennsylvania-born wife, Rachel Newman Marshman (b. 1812). According to the 1850 US census Newman was living with an aunt, Ellen Marshman (b. 1815), and his two brothers, Benjamin (b. 1842) and Robert (b. 1847). Despite being young, in 1864-65 he took part in the American Civil War. In 1870, aged 24, and with his whole family now reunited, Marshman was working as a clerk in a store. In late 1870s he worked as a professor of music. 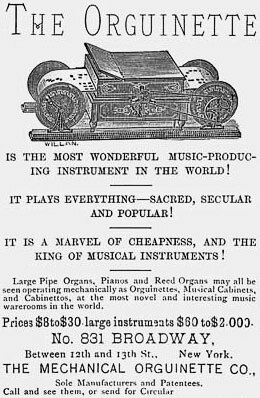 At that time he devised an orguinette (see the image below), a small portable reed organ mechanically played by turning a crank (Marshman got three patents for this device, in 1878, in 1882, and in 1884). This type musical devices have an important place in history as the first affordable instruments for the mass distribution of recorded music. The music was recorded on paper sheets or rolls, cardboard disks or pinned wooden cylinders. The organettes were made in big quantities and in a great variety of styles, beginning in the late 1870s and continuing until superseded by the gramophone in the early 1900s. In 1878 Marshman invented a player harmonica (US Patent 209492), the music for which was "written" as a series of holes punched in a roll of paper. The player blew into the mouthpiece while turning handles that wind the paper roll through the instrument, determining which notes are to be sounded. In early 1880s Marshman continued working in this area, and in 1881 he invented a flute organ, followed by yet another musical instrument in 1883. By 1881 Marshman had moved on to toy inventing, in particular a Toy Theater or Punch and Judy Show (see below), which he patented in 1882 (US patent 256909). In 1882 Marshman began a long-lasting partnership with another inventor—Lee Burridge. They combined to work on a toy and advertising medium and jointly patented it (US patent 296724) in 1883. In 1884 they devised the Sun Index typewriter. In 1885 it was patented (US patent 315386) and went into production. The Sun Index was very successful and the sizeable profits it made allowed Burridge and Marshman to be kept almost fully occupied for the next 12 years. During this time, Burridge and Marshman produced and tested 685 prototypes as they tried to perfect a typebar typewriter. In early 1890s Burridge and Marshman devised and patented two adding machines (see the adding machines of Burridge and Marshman) and a cash register. In 1896 they offered a swinging type shuttle typewriter to the American Typewriter Company, but it failed. Soon after this failure they went their separate ways. In late 1890s Marshman made three attempts to come up with his own typewriter, and obtained three patents for typewriters (US patents 636156A, 636156A, and 672680A), and for an inking ribbon for typewriters, but obviously without success. Later he patented a coal-carrying vessel or bag (1905), a sweat band for hats (1908), etc. In 1910 Marshman returned to his first pursuit, musical instruments inventing, but by 1915, aged 69, he was out of work. In 1873 Newman Marshman married to Josephine Marshman (born Sep. 1853). They had three children, but all of them died in infancy. 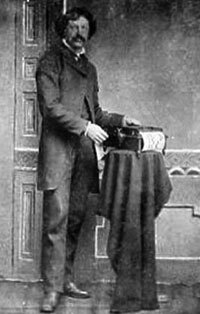 Despite being an inventive genius, at the end of his life Newman Russel Marshman was a penniless servant in the Baptist Home for the Aged in New York City. He died in Bronx, NY, at the age of 83, on 2 November, 1930, and was buried in Poughkeepsie Rural Cemetery.